One of the men who saved my life. Leeds is a large city in West Yorkshire, in the north of England. I'd never really been before but in the past year and a half it has become my second home. Through all of my time travelling one particular song seemed to be on the radio all the time and I now think of the time just after me being diagnosed whenever I hear it. I'll stick it on here so you can all have a listen. I first travelled to Leeds General Infirmary on the 17th of September to meet my consultant for the first time. His name was Professor Ian Lewis and I have to say I think he resembles a teddy bear. He is one of the men who saved my life and I love him to bits and I doubt I could ever repay him. I also met my Macmillan nurse, Carol Irving. She would prove to be amazing in the following year or so, and her expertise and care was invaluable. Think of her like a guardian angel, looking after me, my family and friends. My parents and I sat and spoke to Ian Lewis for roughly three hours. I don't think I've ever seen either of my parents cry so much and it was more upsetting to see them upset than it was for me to be ill. Ian (yep, first name for a Doctor! On Teenage Cancer wards we always call them by their first names) told me that I would be on a three week chemotherapy cycle, with each time in hospital having chemotherapy lasting four days and three nights. I would be hooked up to a drip for four straight days each time I was in. 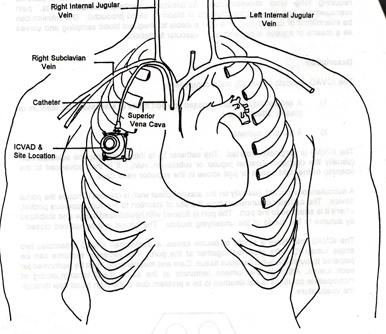 I would also have to have something called a Portacath inserted into the my main vein leading into my heart. This port itself would be on my ribs just underneath the skin. This is where the needles would be hooked into me. This was because the chemotherapy I was on was so toxic if it was inserted into my veins it would destroy them. The image below shows where it would be put and how it works. Ian also told me that the chemotherapy would make me infertile, meaning I would be unable to have children naturally. I could however store sperm (more on this fun and embarrassing part of my experience later) and had an appointment booked for me to go and store some, so that I could have children via IVF later on in life. Luckily, as an IVF baby myself, I merely saw it as continuing a family tradition! I mentioned the statistics I had found online to Ian and he calmly told me that statistics are often misleading and can cause unnecessary worry. He used a fantastic example to illustrate how misleading they can be. He told asked me if I thought a 60% survival rate sounded good, to which I replied that I thought it did. He then put it another way. Imagine a group of five of your closest friends. Two of them would die according to a survival rate of 60%. He also explained that no two cancers are ever the same. Your cancer is a mutation of your own cells and no one else's, so statistics can often show a false picture. He then asked me if I wanted to go through with chemotherapy. He said it was an extremely strong chemotherapy regime (name for a collection of different chemotherapy drugs) and that it had killed people before. He explained I would be very very ill, I would get infections which would leave me in hospital for weeks at a time, I would be so tired I would need a wheelchair sometimes, I would need blood transfusions, I would be spending a long time in hospital, I would lose all my hair, I wouldn't be able to eat for weeks at a time, I would feel like living death and even after all this there was no guarantee it would work at all. It was the equivalent of having industrial strength bleach pumped into my body every three weeks. It would damage my heart and other organs because of the strength of the drugs. I was told it may shorten my lifespan and give me health problems later in life too. He asked me if I wanted treatment or not. I knew the only other option to chemotherapy was letting myself die. Letting the cancer win. I didn't really feel like dying at 16. I told him I wanted to start chemotherapy as soon as possible. I was starting to realise how hard it was going to be. But I was starting to realise that I could fight my cancer at least, and would for as long as possible. Even one extra day would be worth fighting for.